Hopefully you will already have access to electricity when you purchase your plot. This will be needed during the build to power tools and supply light. Notify the supplier that you own the plot and will require connection to the house at a time that is convenient to you. If you have to arrange to connection of electricity to the site liase with the other utility services, as they will normally all use the same trench system into your home. You are responsible for the services at the point it enters your land. This could be a long distance from your home and will need to be accounted for when costing the build for finance purposes. Ensure that all cabling is in place before the house is plastered. Not only will this look neater but will save work if at a later date you need to channel out runs in the wall because it was forgotten. Using conduit will make access easier if any work has to be done with the electricity supply at a later date. Although there is not normally a great choice of where the fuse box can be sited ensure it is at a level where the metre can be read without contorting the body. It must also be in a place where the utility company can access it for readings and inspection. 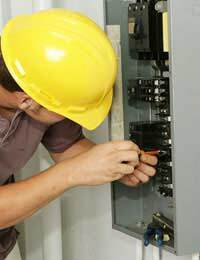 Electricity is not something the unskilled person should contemplate working with. It can be dangerous not only to the person installing the service but for anyone living in the house. The contractor you employ should be able to show you his credentials before you hire him. Like all contractors get a quote for the job in writing. The luxury of a self-build is being able to have as many socket points and light s as you need. Remember that nowadays there is an enormous amount of electrical items used in bedrooms as well as living areas. With computers, televisions, DVD's and telephones in most rooms you will need to consider carefully what to put and where. A socket just inside each door is also advisable for vacuum cleaners and other appliances. Choosing the lighting for a home can be overwhelming. If in doubt visit a lighting showroom and get expert advice. Many of the large DIY stores will have staff who can advise or leaflets on the subject. Consider what sort of ceiling lighting you require, hanging pendant style, lights on tracks, hidden spotlights. They will all need consideration as will the switches and where to place them in each room. Add to this the style of switch and selecting and organising your personal lighting requirements can become a daunting prospect. Don't forget that you will require access to electricity in your garage and outside in the garden. Outdoor lighting, mowing the lawn, running a pump in the pond or even servicing a swimming pool should also be considered. Never think of the electricity supply as access to power. It has its place in your self-build to bring style and individuality to your new home.